I finally managed to get my hands on this coconut Toblerone as a belated birthday present. I've had my eye on it for some time, especially as my love of coconut has grown recently. Basically, it's a regular Toblerone, but with added coconut pieces. It's a good addition though, an extra bit of crunch with a bold, natural coconut taste. It's a little overly sweet, especially with the almond nougat still in place, but the coconut does prevail, making for a great overall flavor. 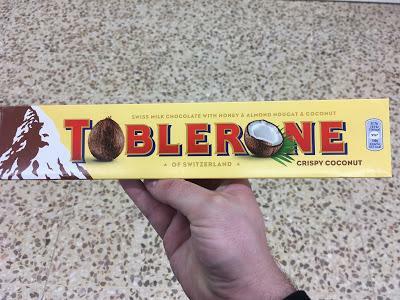 A smooth, chocolatey coconut treat, a pretty unique Toblerone.